Education plays an important role in our “Quality Matters” policy. Below you will find “Learn-to-Sew” classes, General sewing classes and some basic Alterations sewing classes. Thank you for your interest in our classes. Please check calendar for Dates,Time & Fee. Ph. 408.298.5696. Or download a registration form and follow the instruction for mail-in registration.We cannot accept registration by email or by phone at this time. Learn To Sew Series Ages 16+ Learn to use a sewing machine, Pattern Layout, Project Construction and more. Learn how to set-up and do basic stitching on yours or the our class machine. 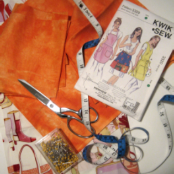 Class will cover how to use a commercial pattern to prepare and layout the pattern pieces and cut the fabric. No sewing machine techniques are covered. This class can be taken as a Stand-Alone class for those wishing to learn how to use a commercial pattern. Great class for those that learned to sew without a commercial pattern. Take this class to learn basic sewing techniques like seams, overcast, hemming, and top-stitching while you make a real project. The class will take you through the construction of you first sewing project. Supply List for details of sewing tools and material required. This is given to you when you have paid for you class. Take this class after you have completed Beginning Sewing or if you are an experienced sewer and wish to increase your sewing skills. Construct a sewing project of your choice based on a commercial pattern. During class, the instructor will help you with the required sewing techniques as you work through the construction. Instructor approval is required for extremely large or complex projects. 1. Basic sewing machine operation. You must know how to set-up and do basic stitching on you own sewing machine or on the class Viking sewing machine. 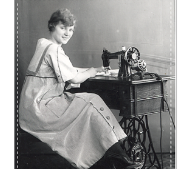 See Sewing Machine Basics class information if you need to learn how to us a sewing machine. If you are using your own sewing machine, it must be in good working order. 2. Cut your fabric according to a commercial pattern. See Pattern Layout class information if you need to learn how to cut your fabric. Learn how to hem a pair of jeans on your sewing machine. Topics to be covered: Fold up and press new hem; Thread, needle, stitch selection; Stitch over the heavy seam allowances (hump jumping). 2.The sewing machine must be in good working order. Skill Level: Beyond Basics. Must have basic sewing machine skills. Learn how to alter your T-shirts and similar knit tops for a more flattering fit or to add your own design details. Students will learn how to: Hem or reshape the bottom edge or the sleeves; Contour the side seams for a more form-fitting silhouette; Reshape the neckline; Add pleats, tucks or darts. Students will alter one or more of their own T-shirts or knit tops. Machine techniques covered include twin needle hemming, creating stretch seams, and overcasting.